Los Angeles celebrates Labor Day | Fight Back! 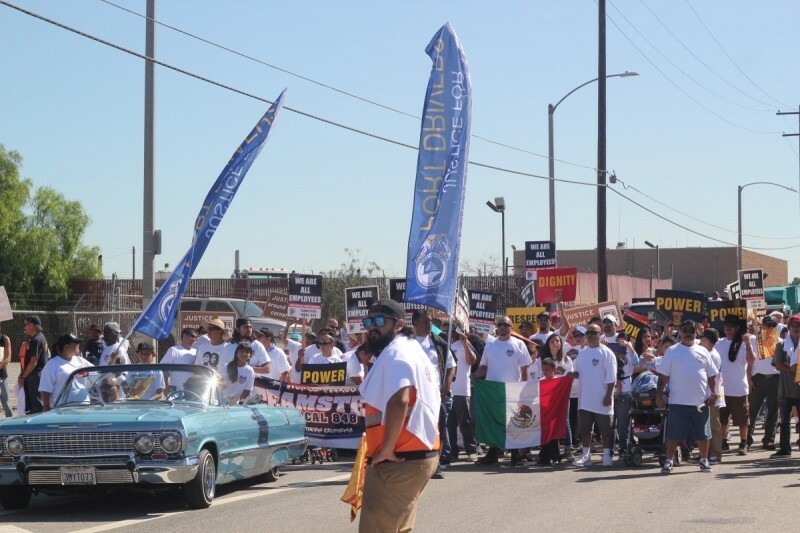 Los Angeles, CA - On the morning of Sept. 7, Labor Day, hundreds of union members and families joined together, in LA’s Wilmington Community, to celebrate unions and the working class. Many members from a host of trade unions talked about past victories in contracts and recent organizing drives. The event was organized by the Los Angeles/Long Beach Harbor Labor Coalition. The Coalition is comprised of port workers with the International Longshore and Warehouse Union (ILWU), different Teamster locals, as well as other unions including, SEIU and the Unified Teachers Los Angeles. People marched through the neighborhood of Wilmington – a historic working-class Chicano neighborhood and home to port workers in Los Angeles. Marchers waved banners and signs and drove decorated tractor trailers through the street. The march ended at Banning Park, where people gathered to hear speakers, enjoy food, listen to live music and watch traditional Mexican dancing. The Labor Day event is held yearly and unites local unions to honor past struggles and to celebrate new union victories.